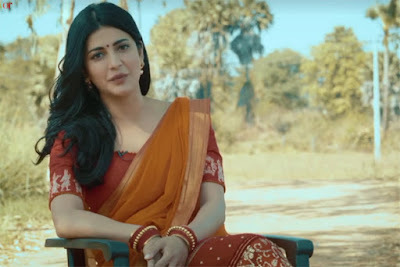 The heroin star Shruthi Haasan is saying that there has been much transformation in her when compared from the days 'Gabbar Singh' to the 'Katama Rayudu' days. But Pawan Kalyan does not change much. As 'Katama Rayudu' is preparing for release, the unit of the film has released the video of Shruthi Haasan talking about Pawan Kalyan. "When I see Pawan Kalyan ... I remember his thoughts, his concern for society more than for his films, he is a person who has so much responsibility towards society, he always thinks about people, he talks about them with me. If I had done 'Gabbar Singh' a long time ago, there has been a sea of ​​changes in me when I compare myself now to the days of 'Gabbar Singh', but Pawan is the same, he is speaking the same way. " "I had several doubts before signing 'Gabbar Singh', I was in total confusion if I focused on teluguas films or Tamil movies, but I had a break after Gabbar Singh and never looked back.Pawan Kalyan changed my career It's a Unique person, speaks less ... but speaks only good things, has been there in the industry for the last 20 years, is a special occasion, I wish to continue for 20 more years.